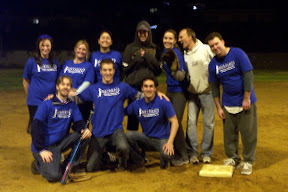 Brian C Mounts: Merecats Softball 2006-2007 Champions! I never really got around to blogging about this last weekend so I thought I'd take the time to do so today. 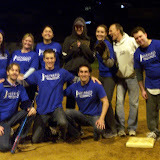 Last Friday night was the Championship/Playoff night in the Point Loma YMCA Softball League. Flor and I have been playing softball every Friday night for the past 3 months or so and it's been a lot of fun, much more fun than I ever expected. Over the course of the season Flor became the second baseman for our team and I became the first baseman. All those many games in little league at first came back to me quickly. Anyway we weren't an amazing team but we ended up winning a stepladder playoffs last Friday to take home the championship. We won! We won 3 games in a row in fact to take the championship! The last game was crazy, we ended up almost not even playing it because the team we were playing against was not fun to play. They were like moron kids on steroids and had very abrasive attitudes. Not to mention they all were on steroids and thought they were entitled to not just win every game but beat up on the other team too. We ended up playing them and going into the last inning we were down 10-4. Needless to say we scored 7 runs to take an 11-10 lead and we sealed the deal with a 1-2-3 inning for the win. Flor made the game ending catch a soft hooking line drive to second base that was deemed "The Catch". Man that was fun... and tiring. Flor and I were both sore for a few days after the 3 1/2 hour softball marathon. 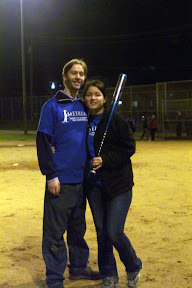 A couple pictures from our softball nights are featured below. Maybe I can get a few more better quality pictures and add them to my gallery at a later date but until then these are the best I've got.